A nine-year-old support group in Connecticut allows them to speak freely without judgment. GROTON, Conn. — Carol Caswell used to think it was her fault that she ended up raising her daughter’s children. “I thought I’d done something wrong,” said the 57-year-old Caswell, who along with her husband, David, is raising Katrina, 12, Mackenzie, 10, and Kaylee, who turns 2 the day after Christmas. So Caswell joined the Grandparents Raising Grandchildren Support Group in Groton, which began nine years ago and has served more than 40 families. 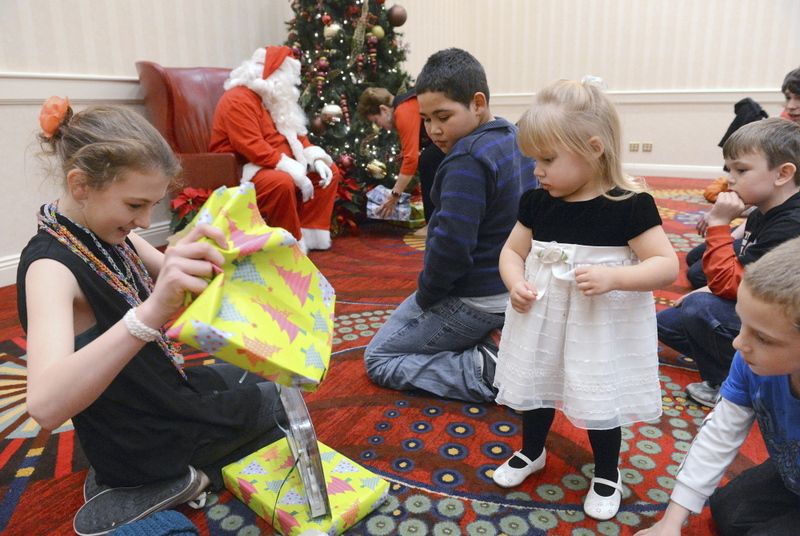 The group, which has drawn grandparents from communities including Norwich, Waterford, New London, Old Lyme, Madison and Old Saybrook, held its annual Christmas party last week. “I needed to talk to somebody, and it was the best thing I ever did,” she said about joining the group. After she joined, Caswell said she didn’t feel so alone. More than 18,000 children in Connecticut live in homes where grandparents head the household and are responsible for them, according to data compiled by six groups, including AARP. Of the total, more than 7,000 children have no parent present in the home. Diane Schrage, a counselor at Groton Human Services who runs the monthly support group, said there can be harsh and unfair judgment directed at older adults raising grandchildren. Schrage said some organizations have also changed the name “Grandparents Support Group” to “Grandparents Resource Group,” to make it more palatable. The Groton group meets from 6:30 to 8 p.m. on the first Thursday of the month in the Groton Human Services office. Schrage believes part of the group’s success is due to offering child care during meetings. She said children also have the chance to meet others who are in their situation. Grandparents said the group allows them to speak freely without fear of judgment. Lee Faustino, who is retired from the U.S. Navy and disabled, and his wife, Bertha, are raising their 12-year-old granddaughter. The child’s mother, Faustino’s daughter-in-law, was killed in a car accident years ago. Faustino’s son was unable to care for his daughter after that. Sometimes, Faustino said he feels robbed of his retirement, even though he wants to care for his family. He wishes he could have “an immortal life,” he said. “The young ones, they’re so fast for me. I cannot catch them. I cannot run,” he said. Sharon Salen, 65, and her husband, David Salen, 67, are raising their 8-year-old grandson, Evan. They’ve had him since he was 11 months old. “He’s just a love,” Sharon Salen said. David Salen is in a wheelchair, though he can walk a few steps. He stays home with Evan. The boy sometimes pushes him in his chair. “Listen, I’m spoiled rotten,” David Salen said. Sharon Salen works full-time as a nurse at Pendleton Health and Rehabilitation Center in Mystic. The biggest challenge is school work. A teacher wrote Salen recently that if she had a question about the computer, Evan could show her. Caswell has three grown children. She said her youngest daughter suffered from mental illness and turned to drugs. She has had her daughter’s oldest two children for about five years. The little one, Kaylee, has lived with her grandparents since she was 4 months old. Despite the difficulty with her daughter, the grandchildren have brought Caswell joy.